In my Nexus 5X review, I mentioned that the original Nexus 5, a phone two years old, performs better with Android 6.0 Marshmallow than the new LG model. I don’t know how that is possible with all of the new tech inside of the 5X, but it was painfully obvious. Outside of the camera being pretty poor in the original Nexus 5, it’s still a phone worth considering at the right price. $209 might be the right price. 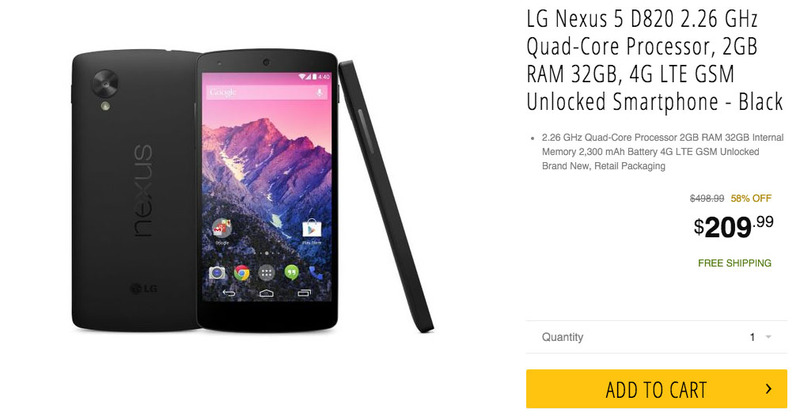 In a deal currently running through Newegg Flash, you can buy the Nexus 5 with 32GB of storage in either white or black for just $209. This is model LG-D820, which is the North American variant that works on carriers in the US like AT&T and T-Mobile. As a recap, the original Nexus 5 sports a 5-inch 1080p display, 2GB RAM, Snapdragon 800 processor, 8MP rear camera (with OIS), and 2300mAh battery. It has also been officially updated to Android 6.0. The phone purchase includes free shipping.